When Cork City Ford Centre opened for business in 2006, it was the latest chapter in the Nolan family’s long association with the Ford brand. The dealership has gone from strength to strength since then with 2015 promising to be its busiest year yet. A vibrant urban motor dealership strategically located just off the Airport Road in Cork, Cork City Ford Centre offers the full range of Ford cars and commercial vehicles. Also offering servicing, parts and accessories, and tailored finance packages, it is one of just 20 Ford Commercial Centres in the country. The Nolan name is synonymous with Ford, just as Ford is synonymous with Cork. The late Eddie Nolan joined Ford in 1958 and spent 13-and-a-half years as managing director of Ford Ireland before setting up Cork City Ford Centre in conjunction with Cormac Hughes of South Dublin Ford Centre nine years ago. In 2009, Eddie and his son John took full control of the business and they worked together to establish it as one of Ireland’s foremost Ford dealerships before Eddie’s untimely death in 2013. Undeterred, John is committed to growing the business further and maintaining his family’s indelible links to Ford for many years to come. “My father worked with Ford for 42 years and was obviously a massive help to me in getting the garage off the ground in an extremely challenging environment,”recalls the affable dealer principal. Cork City Ford Centre prides itself on its commitment to quality, excellence and value-for-money. 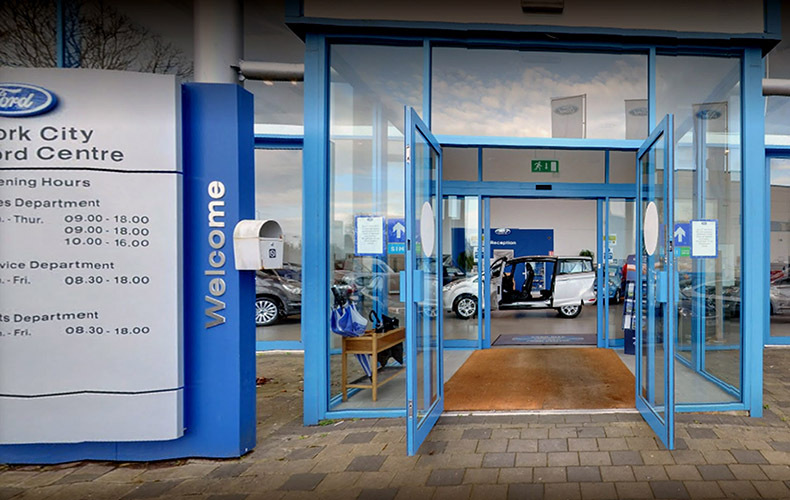 Visitors to the state-of-the-art showroom will be impressed by the high level of customer service and tempted by great offers on a huge range of new and used vehicles. Whether it is a car or commercial vehicle you are looking for, John and his team have the vehicle to suit you. “The requirements of a car owner and a van owner are completely different,”John explains. Cork City Ford Centre stocks the complete range of Ford commercials to complement their equally impressive range of passenger cars, which includes the all new Mondeo, Focus, Fiesta, Ka, Kuga, B-Max, C-Max and Galaxy. The Ford Transit has long been the market leader and Ford’s flagship commercial. The other Ford commercials are the Transit Courier, Transit Connect, Tourneo Connect, Transit Custom, Tourneo Connect and Ford Ranger. Completing the line-up are the Fiesta and Focus vans. “We have something for everyone,”notes John, who goes on to explain how Cork City Ford Centre has placed a major emphasis on its commercial division from day one. “Ford launched a new Transit and Transit Connect in 2014 and they have both been a huge seller for us. 2014 has good growth in commercial vehicle sales. Our commercial sales were up 250 per cent on the previous year which is not only a reflection of how well the economy is recovering, but of the quality of vehicle and service we offer customers. “We also offer some fantastic deals. For example, customers who buy a new commercial in the first quarter of 2015 will have a year’s free road tax. In addition, we can arrange great low rate finance deals through Bank of Ireland. Our lowest rate at the moment is 3.9 per cent. Cork City Ford Centre employs 18 staff, including eight technicians in its workshop. The eye-catching premises on Forge Hill spans 12,500 square feet. The range of services offered by Cork City Ford Centre extends to contract hire, leasing and hire purchase & vehicle valet . The thriving garage provides the complete Ford experience, so make sure to call in the next time you are passing by. As the business nears its 10th anniversary, John and his staff look forward to servicing the needs of the Cork motoring public for many decades to come.